The diesel engine owes its existence to the experiments and research carried out by Rudolf Diesel from 1893 to 1897 at the MAN premises (Maschinenfabrick Augsburg Nueremberg) of Augsburg. The first self-ignition endothermic engine was the result of the intense work carried out during those years. Diesel's invention changed the course of history, for in 1897 his propulsor was able to reach a mechanical efficiency of 26% whereas similar-powered steam machines in the period did not exceed 6%. As early as 1923, MAN engineers created the first direct injection fast diesel engine and only a year later these began to be used for land transport vehicles, in industry and on passenger ships and fast vessels. Other milestones in the history of the diesel engine include the first use of a turbo supercharger in 1951 and then the cooling of supercharged air, known as inter cooler. The research objective of MAN engineers has always been to achieve the best combination of several factors such as power, operating economy, respect for the environment and limited dimensions. In order to achieve these results, it is necessary to exploit the latest progress in engine technology while continuing to experiment and seek new solutions. The first diesel engine in history, that of 1897, had a cubic volume of 20 litres, weighed 4,500kg and was able to deliver 20HP. An engine nowadays with the same displacement weighs 1,800kg and can deliver as much as 1,300 HP. These data clearly demonstrate the value of developments in the mechanics industry. 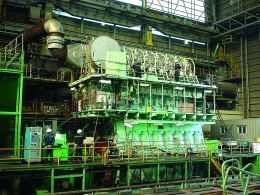 MAN marine engines are designed according to a modular system which offers several advantages such as the possibility to use a large number of identical components in various types of engine. 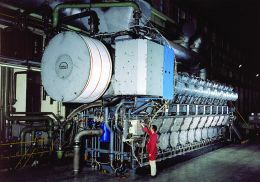 The MAN engines are used for several types of ship and gliding and displacing luxury yachts thanks to a wide range of engines developed by the company to meet different needs. In Italy MAN engines have been imported and sold since as far back as the 1930s by the Ranieri Tonissi company of Genoa; via Albisola 68; 16163 Genova; tel. 010 711583; fax 010 712066; web site www.tonissi.com; e mail info@tonissi.com.